Many cat-owners have experienced it. You come home from work or wake up in the morning to find that an article of furniture or an area of carpeting in your home that was previously perfect now sports gouges, tears, rips, or frays. There is only one member of the family who could have done it: your cat. The frustration that humans feel when their feline companions injure or destroy beloved or expensive household items is understandable. After all, it's hard to comprehend why they would do such a thing. Sometimes, we can feel as though our cat has ruined our belongings because they were angry with us or wanted to get back at us for something (like going to work). The truth is, cats have valid, inborn reasons for scratching things that have absolutely nothing to do with malice or mischievousness toward their humans. Understanding why cats actually scratch objects in our home can go a long way toward maintaining a peaceful, loving relationship with them and also help us learn how to keep our belongings safe from claw-marks. We've all seen our cats bathing themselves. In fact, cats have a reputation for being fastidious in their grooming habits. A large part of their time is spent licking their bodies all over, chewing out small mats, and licking their paws and rubbing their faces with them (an especially cute part of the ritual). When we see cats doing these things, it's easy to identify that they are grooming themselves. It's not as easy to associate scratching behavior with grooming but part of it is. Scratching at rough surfaces removes the outer husk from a cat's nails periodically. This process frees the newer, healthier nail beneath. Scratching behavior is often misinterpreted as a cat sharpening their nails but they aren't actually creating a sharper surface, just getting rid of a duller one. In the wild, cats don't spend too much time in groups, so a lot of their communication is done by leaving messages for each other. Much of this revolves around territory. Scratching behavior is a big way that cats can advertise their claimed territory to other cats. Feline paws contain scent glands that, when pressed on during scratching, leave an odor that is undetectable to humans but unmistakable to other cats. The visible marks made during scratching are equally readable to other cats and explain why they love to scratch things that shred beneath their claws, leaving a visual signpost. Even when cats live alone in homes without other cats, they feel this need to communicate territory information, just in case. Scratching provides an excellent stretching for the muscles, tendons, and joints in a cat's toes, feet, legs, shoulders, and back. Any athlete can tell you that stretching before and after exercise can go a long way toward keeping a body healthy and protecting it from injury during exercise. It also feels good! Cats scratch multiple times during the day, but they almost always scratch when they first wake up, providing a good idea for placement of scratching posts or pads near favorite napping spots. When an indoor cat sees something exciting outside, like another cat or other animal or bird, we will often see scratching behavior. Your cat may run suddenly from one room to another, vocalize, and stop and scratch vigorously. This helps expend some of the energy that develops when your cat can see something exciting but not interact with it directly. 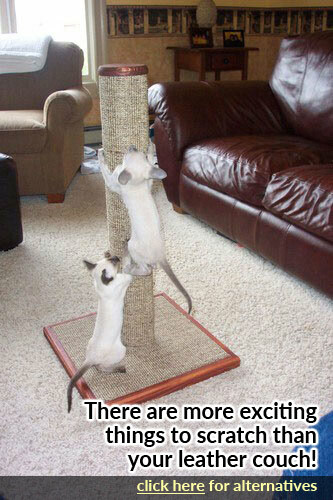 This is understandable behavior when you look at it from your cat's point of view and provides more ideas for scratching post placement (near windows and doorwalls). But Why Scratch My Furniture? So now we know why cats scratch, but why is it the furniture? In the wild, cats often use trees and logs for scratching. They are solid, sturdy, and their claws leave a nice, visible mark on them. Your sofa, dining room table, and other furniture can have the same nice properties. As you can see, cats scratch because it is a natural, ingrained response, and they scratch furniture because it is conducive to a good scratch. Understanding this can help you create better scratching options and a more peaceful home for you and your feline friend. 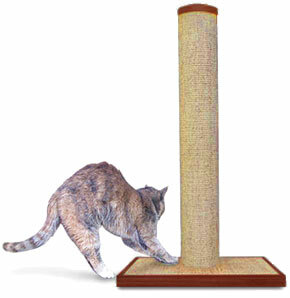 Providing your cat with an appropriate alternative to your furniture for scratching begins with choosing scratching posts that have the properties that cats love. You can learn more at the Purrfect Post Info page.